You can always depend on Mytopia to deliver top quality, affordable and durable Euro-Chef Meat Grinders, Meat Slicers & Sausage Makers. Now you can easily enjoy great-tasting burgers, sausages and meat in the comfort of your own home. 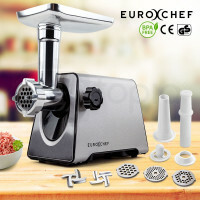 The Euro-Chef Meat Grinder and Sausage Maker allows you to turn meat into a 7mm, 5mm or 3mm format, making it the ideal kitchen tool for creating ingredients for dishes like steak tartare, meatballs, patties for burgee, kofta and pie mince. 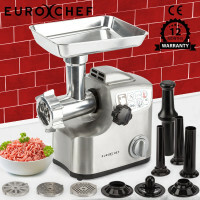 When you buy a Euro-Chef Meat Grinder and Sausage Maker in Stainless Steel, Black, White or Red you will get 3 stainless steel grinding plates, a food pusher and a sausage making attachment. Although it comes with a sturdy ABS plastic housing, this product can be easily unassembled and cleaned thoroughly. All Meat Grinders come with a bonus kibbe maker and a 12-month Australian warranty for complete customer satisfaction. 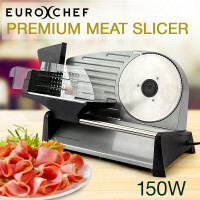 Euro-Chef Premium Meat Slicers are the ideal tool for slicing hot and cold meats. Furthermore, it can also be used to slice other deli products such as vegetables, fruits, bread, sausages and cheeses. Built with quality cast aluminium structural components and sleek minimalist design, this food slicer comes with suction cup feet for safe and stable operation. Available in red, silver and black, the cantilever design and tilted food carriage enables fast and efficient slicing. 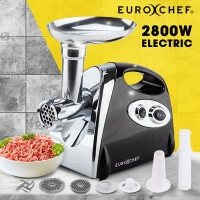 When you buy your next meat grinder and meat slicer in Sydney, Melbourne, Brisbane or anywhere around Australia, don’t forget to check out the other excellent kitchen appliances available at Mytopia. We offer a refined collection of Air Fryers, Deep Fryers, Soup Makers & Blenders, Slow Cookers, Popcorn Machines, Food Dehydrators, Ice Makers and Food Waste Disposers.